Before we get to the recipes I would like to wish everyone a very Happy New Year. What a lovely final week of 2009 it has been but I am most thankful for this beautiful snow storm that blanketed our area in these final days of the year. 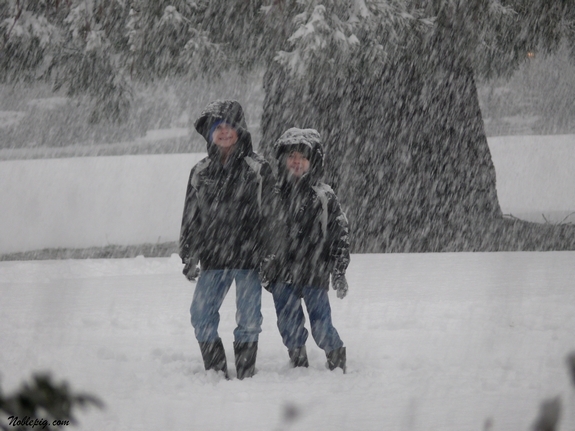 Having lived in California my whole life, with little to no seasonal changes, this is a treat for me and my boys. The backyard became a virtual winter wonderland and the boys took advantage of all the freshly fallen, powdery snow. I spent the day throwing wet mittens and hats into the dryer and replacing them with dry ones so the boys could continue their winter antics without interruption. Snow angels and snowmen were made with lots of snowball fights in between. To have this right out our door was really a treat. We are lucky enough to have a beautiful atrium in this house and from every common room and hallway we had a beautiful view of the snow. It was magical. But let’s get to those top recipes. These recipes are the top 10 recipes on this site by my site analytics. They have swirled around the globe many times over and continue to be printed fast and furiously. Enjoy and have a wonderful New Year’s Day. Starting with number 10…Tangy-Sweet-Plum Spiced Chicken. This is continually requested by my oldest son, thank goodness it’s so easy to make. 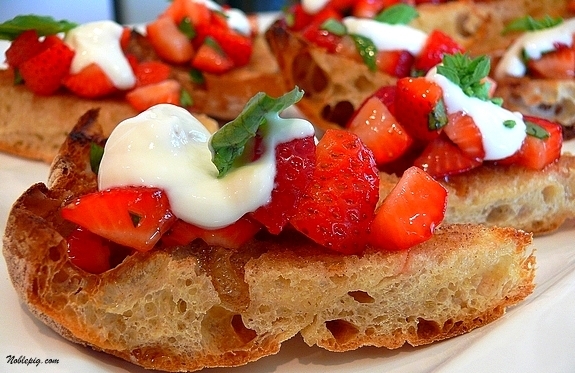 Number 9 is the perfect brunch item, Breakfast Bruschetta with Strawberries and Tangy Cream. You will love it. 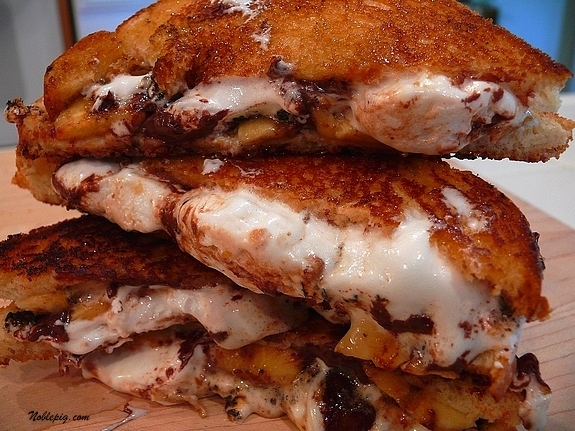 Number 8 is not a wise choice if you are on a diet…Caramelized Chocolate, Banana and Marshmallow Sandwiches. 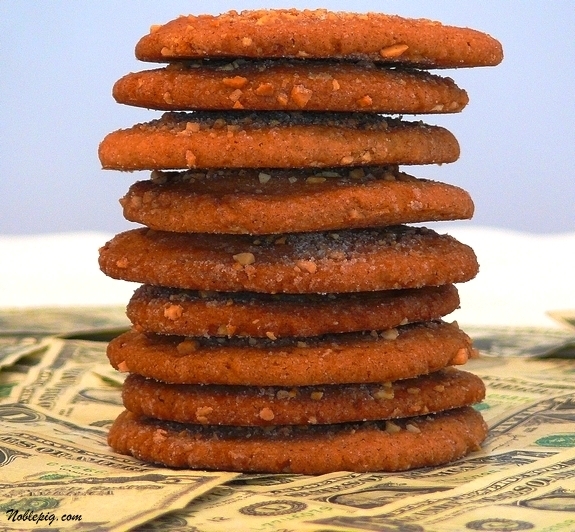 The million dollar cookie winning the Pillsbury bakeoff…Double-Delight Peanut Butter Cookie is holding at number 7. The Upside Down Apple Pie at number 6 is now one of my favorite desserts. 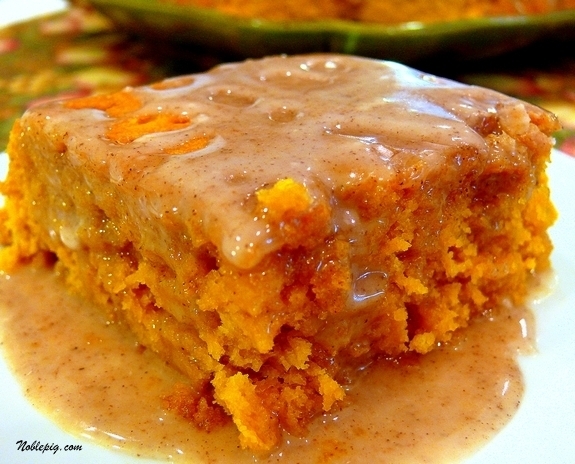 Another favorite at number 5, Two-Ingredient Pumpkin Cake with Apple Cider Glaze. 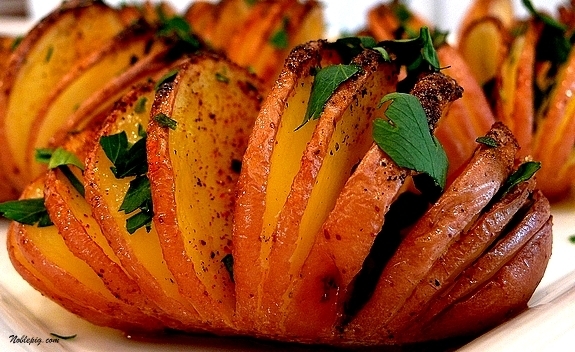 I still love these Smokin’ Red Roasted Potatoes, they are always the perfect presentation. 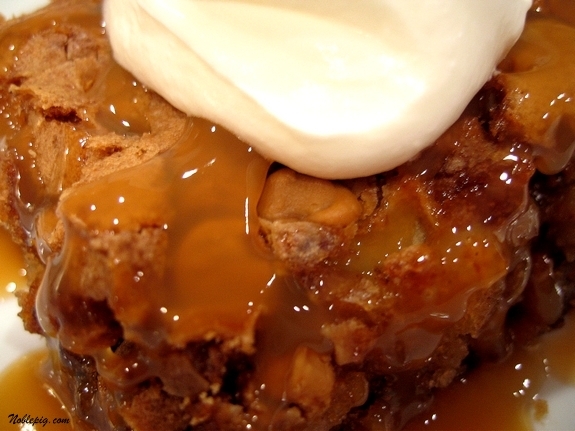 This was last year’s number one, Butterscotch-Apple Cake, now at number 3. 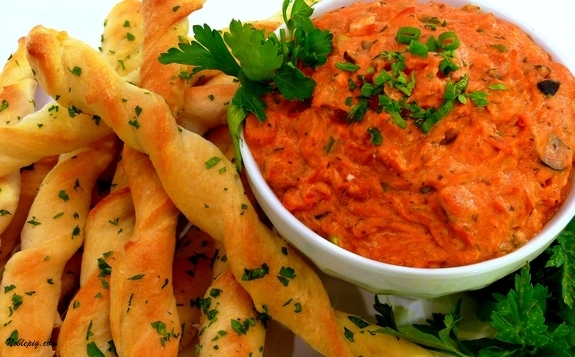 Number 2 is my favorite Superbowl recipe, Cheesy Pepperoni Pizza Dip. NUMBER 1 is the Pasta Pie. I still can’t believe how nice this recipe turns out, you should try it! Hello….when you click on the pizza dip, you get the cake recipe. Happy New Year! Welcome to 2010 Cathy. It is full of possibilities isn’t it? All of these recipes sound amazing and worthy of their own roll call. Happy New Year Cathy. Beautiful photos. I’ve always thought that I wouldn’t like to live anywhere that didn’t have seasonal weather changes. It’s great that you’re loving Oregon and all that snow. These recipes are amazing. Will be trying out a few. Thans for the fabulous recipes. I’ll give a few of them a go after I’ve lost some of this Christmas weight. truely fantastic photos.You are a real artist. Everything about your post is wonderful Cathy…amazing! Good for the boys! Also LOVE the top 10…and can see fanatycal printing around the world again! Slam dunk delicious, each of them! Came here to see what the winning recipes of the year were but just wanted to stay and look at your beautiful snow photos. The one by the atrium is truly magical, Cathy. I love how the snow looks and enjoyed seeing it through your eyes. Also enjoyed how happy your boys were to play in it all day! Happy New Year, my blogging friend. I wish you blessings and prosperity in this year year. Happy New Year Cathy. Thanks for the many hours of enjoyment this past year reading and cooking from your blog, and admiring your pictures too. Wish the big guy and I were there to build a fort with the boys – how fun that would be! The link to the pepperoni dip brings me back to the butterscotch link above it. I guess I’ll have to make the butterscotch apple cake two times then. One for the family. And one for me! :o) I loved ALL your recipes this year. Now I have more to look forward to. Thank you so much for your creativity and deliciousness with all things food. The upside down apple pie was a ginormous hit around here. Everyone who had it asked for the recipe and couldn’t believe it called for refrigerator pie crust! Wishing you a happy 2010! What a wonderful recipe roundup! Beautiful, Cathy! Living in SC, we don’t normally get a lot of snow. usually just a dusting. But occasionally we get what the kids dream of and hope for each year. Thank you for the New Year wishes! And I hope you and your family have a very peaceful and prosperous new year! I’m saving the Upside Down Apple Pie and the Pasta Pie! Beautiful snow! Happy New Year in your new world!!!! Love all the recipes! Happy new year! The links on a couple of the recipes are mixed up (#2 and 4, I think) – I’ll go back and find them in my history. Got the links to work…I have so enjoyed your site this year. The potato recipes usually put me into the big pants…but any of these will probably do the trick. Happy New Year! Boy am I jealous of your atrium. You live in the most beautiful spot I could ever imagine living…wow. Just wow, that snow!! Happy New Year. The caramelized sandwiches are to die for, I mean really…ooey and gooey, ahhh. Have a lovely new year, it is beautiful were you live. But, the view out my back window is pretty. Have to remember that. Love your recipes, and I am already planning that pasta cake thingy… Love your site, and happy new year! Just stopped by to wish you a Happy New Year. Still traveling. Will be home next week and life will go back to normal. Have a wonderful weekend. I love your snow photos! I’m sure your boys really enjoyed playing outside. 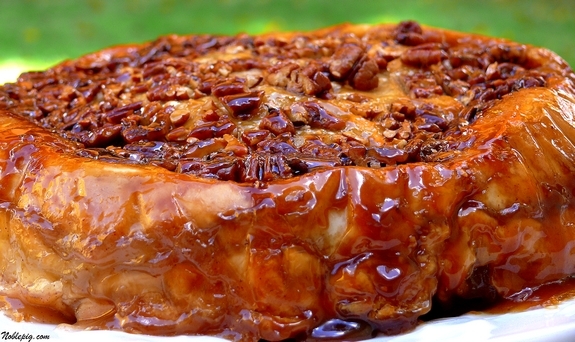 And, thanks for posting these top recipes – they are all making my mouth water. And the recipes? Let’s just say salivation is in full force! I’m so thrilled for you that you all got the snow! I remember each and every recipe and have tried more than half of them. My waistline is not in the mood for thanking you, but I am. Thank you for all the wonderful recipes you share, along with your life. I think you’re are one of the most amazing women ever! Have a wonderful & prosperous New Year! Thank you for sharing your life with us! You make even snow sound lovely (coming to you from the frozen tundra of Wisconsin). Glad you and the hooligans enjoyed the change of pace! The recipes look delicious, as usual. I plan to try a few more this year. I am so proud of you for being upbeat and positive and thankful for what you have in your life – you are a wonderful role model and example. I’m so happy the pasta pie was number one! I made this with my girls a few months ago and it was a huge hit…super easy & delicious. Happy New Year! Happy New Year! Love the snow pictures. I just posted some of our blizzard and all the fun of it on my last few posts. It’s cold stuff, but FUN! Wow! All recipes look delicious. Thanks for sharing such tasty different recipes here. Glad to have found this recipe post. Wow! All recipes look delicious. Thanks for sharing such tasty different recipes here. So glad to have found this recipe post. Great snow pictures! I was surprised by the snow this week but was thrilled to see it. Your recipes look amazing too. Happy New Year Cathy! Love your top 10 and I will definitely try that Pasta Pie. I have bookmarked it so I don’t forget! Have fun in the snow! It looks beautiful. Thsoe recipes all look wonderful and I can tell you that the upside down apple pie is delectible! Happy New Year to you Cathy! We have yet to get any snow in the Seattle area. I wish we would, I love it. Wow – look at all this love! I just wanted to say the snow pix are so pretty! I’m looking forward to trying these recipes too 🙂 Happy New Year! 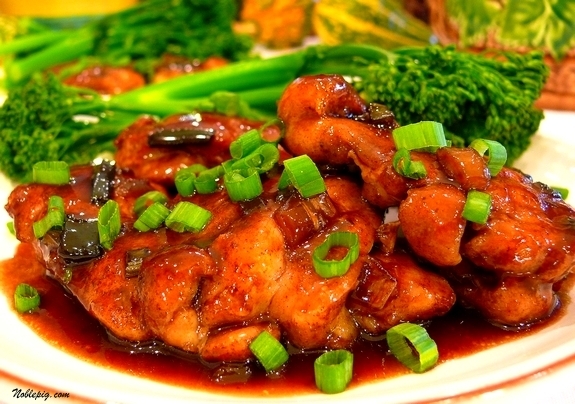 I am SO TRYING the Tangy-Sweet-Plum-Spiced Chicken! Looks delicious! Wonderful recipes and photo’s …..thank you! The photos of the snow are just beautiful. Will have to try the pasta dish. That looks interesting. All look like winners in my book. Love your blog, Cathy! Every dish look scrumptious but if I had to chose just one it would be the pasta pie. 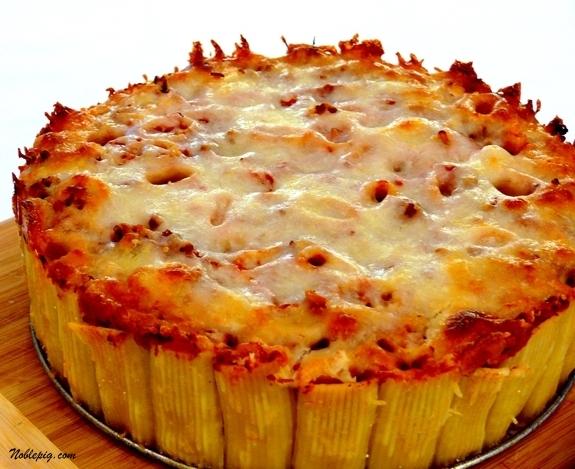 Every dish looks scrumptious but if I had to chose just one it would be the pasta pie. What about your sliders? They are amazing! Happy New Year Cathy! A great line up of recipes to try. 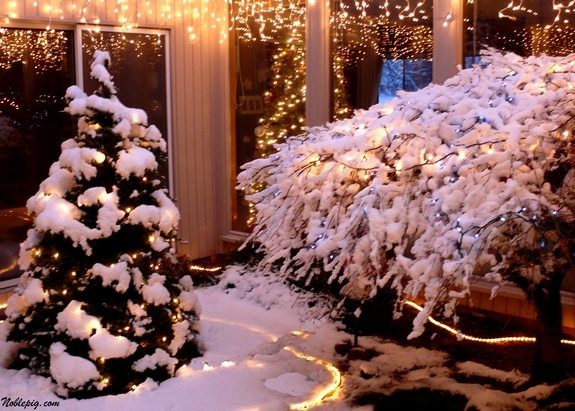 That snow storm looks so pretty, I would love to have an atrium in my house! Beautiful snow and beautiful recipes! I have to try the pasta pie. Happy New Year! Loved the recap, especially since I have most of them bookmarked. Happy New Year to you and your family. 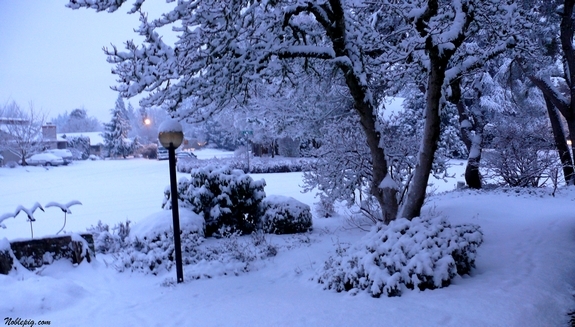 We certainly didn’t have any snow on Christmas in Davis! Happy New Year to you and your family Cathy. May this year bring lots of happiness. your boys look awesome, as always love to see them smile. The food is no question, they look good. Thanks so much for your great recipes! Your photos are divine and the food (although I have yet to try a recipe) looks delicious! I love to see what you’ve created and in the next week plan on making some of these top ten recipes. Keep up the good work! A great top 10 list! Looking forward to more wonderful recipes in 2010. Happy, healthy, delicious new year to you and your family. I love your recipes – thank you for this roundup, and I hope you have a wonderful 2010! How to decide? I can’t–will have to try them all but will start with that pasta pie. Looks amazing! Happy New Year! You got the most beautiful pictures of the snow! I’m a Californian that recently moved up here with my husband, and I was giddy when I started seeing snowflakes outside of my office window! This is a great post and these all are truly top 10 recipes of 2009.It look very delicious and mouth watering.I like all recipes.Thank you very much for this wonderful post. I agree with the Pasta Pie at number one. When I first made this I thought “There is nothing here” and hoped for at least something decent. I made it and me and the wife and kids just loved it. LOVED IT! Thank you for this recipe it is now on normal monthly rotation at my house. 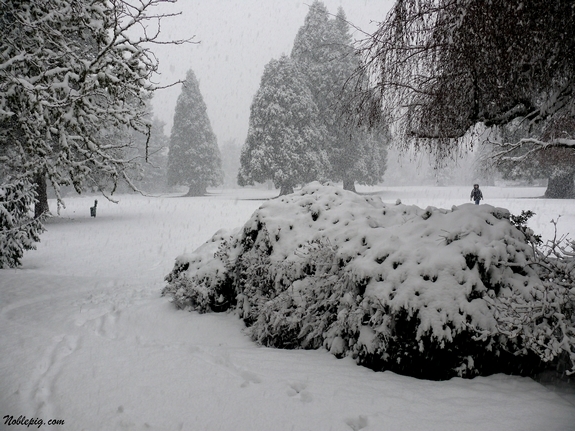 Hope you are all enjoying a fantastic new year under your beautiful (and beautifully photographed) blanket of snow. I love #8 but I am on a diet so this will have to wait! I love #1 the presentation and of course the killer taste!! Looks like a very picturesque holiday for your family! Great top 10 — I still want to try the chicken (#10). What a lovely site you have here – loved your top ten recipes — can’t want to make the pasta pie for my two boys. People deserve good life and mortgage loans or just car loan would make it much better. Just because people’s freedom depends on money. When you’re in the corner and have got no money to go out from that, you would require to take the home loans. Just because that would help you emphatically. I get short term loan every time I need and feel myself fine just because of it.